Coincidentally, this dish is very trendy. A boring workday leads to an over-the-top presentation. I just had to play with this tri-cornered plate! Earlier this summer, a few hours after I bought this awesome tri-cornered plate from Fishs Eddy (for only 99 cents! ), I read that matte black is all the rage this season. I love my dinnerware, but trends, really? Whatever the trend, this dish is delicious and perfect to make right now. Make a visit to your farmers market and get it going. Start the grits using the directions on the box. After bringing the water to a boil and stirring in the grits, make sure you reduce the heat to a very low temperature and cover tightly. You will want to stir occasionally while they cook and soak up the water for 15-20 minutes. Do not use instant grits, ever. 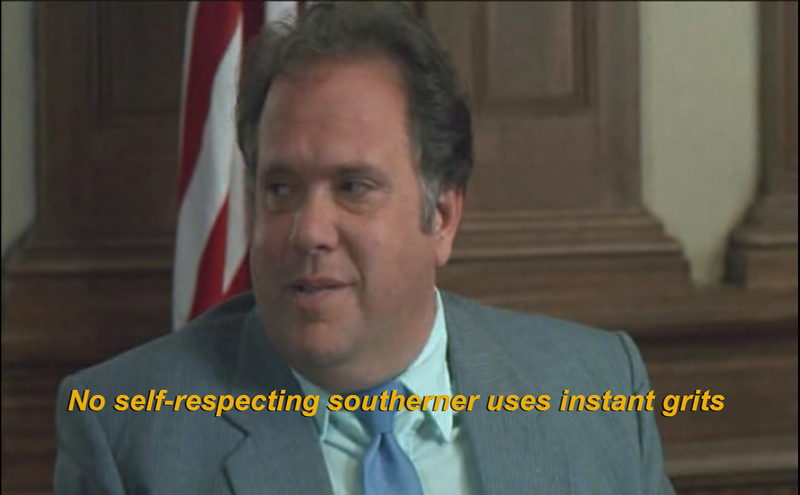 My Cousin Vinny – I think about this scene every time I make grits. Preheat oven to 350 degrees. Wash cod and pat dry with a paper towel. Cut into 4-7 ounce filets. Rub with a small amount of olive oil and season with salt, pepper, onion powder and fennel seeds. Let rest for 15 minutes. Sear the cod in a very hot pan for 2-3 minutes per side. Move it to the oven and bake for 8-10 minutes until fully cooked. Allow to rest for a few minutes so the juices will retain. Slice the eggplant and heirloom tomatoes and season with a bit of salt and pepper. Stir a bit of pepper, butter, and parmesan cheese into the grits and spoon onto a plate or shallow bowl. Top with cod, eggplant and tomatoes. Sprinkle with chopped fresh basil and oregano (or whatever herbs you have on hand.) Enjoy the fresh flavors.